Mappa della Città – Imparliamo Italiano - hoffmanillustrates! The problem with many educational maps is the perspective representations, which are illustrated very beautifully, but confusing for the student. So here I have chosen a to use a plan view. It is easier to tell if something is right or left of an object. Instead of using labels on the map to delineate what kind of businesses or areas there were, I chose icons that are quickly recognizable. The original size is A2, the city map illustration is A3 and is still very legible at a size of A4. The map and icons were created in Illustrator, the poster in InDesign. With this design I have addressed the common learning difficulties of the average student: the large icons to the left of the learning map serve quick orientation and aid use of topics such as “go to the right” or “go over the crossroads”. This is especially important in early language learning: the student can trace the direction of the arrows with their fingers and thus can better anchor the expression to their lingual memory. The small logos prompt important vocabulary for language students with little or no previous knowledge. All places on the map are well chosen – from the doctor to the train – pretty much everything that a tourist might need to ask about is included. The middle field in salmon pink presents typical questions a tourist might have in an Italian city and possible responses they might get. The green field helps the student to learn important orientation vocabulary, such as “before”, “next”, “behind”, “right of” and “left of”. The yellow field contains search tasks that the student can easily solve and gain lingual confidence with. Thanks to the graphic simplicity of the design of this city map, anyone can learn Italian. The small icons prompt important vocabulary usage. 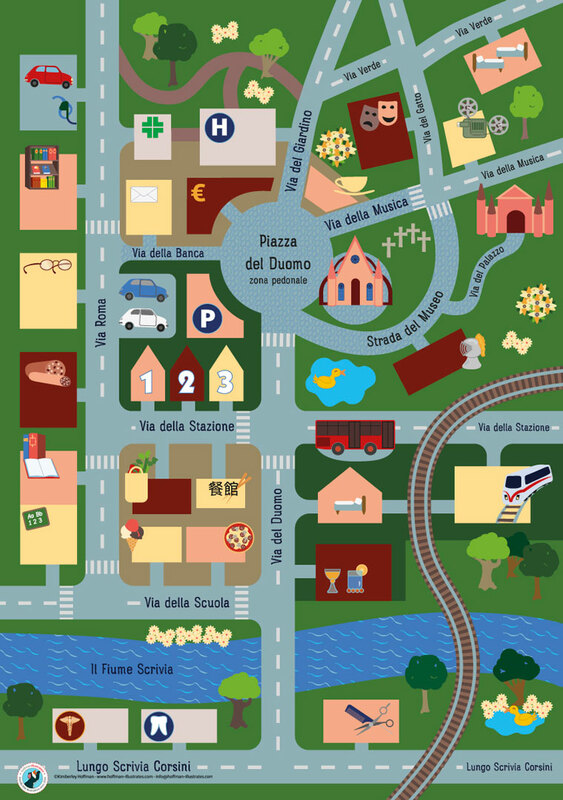 Mappa della città is an educational map for teaching and learning Italian.